Welcome to our listing for this BRAND NEW FMDVSPLTR Recirculating Divertor Dump Valve. The Splitter is a truly remarkable valve that gives a combination of blow off and recirculation valve operation all at the same time and has been specifically designed for the many VAG 1.8T applications. This means you get all the noise of the blow off valve whilst retaining the compatibility with the recirculation requirements of the engine management system. As a bonus we also offer the ability to convert the valve to recirculation only mode for those times when stealth running is required. This valve uses a Copper and Zinc alloy piston which utilises new sealing technology along with a variable spring preload incorporating a ratchet type top adjuster that will allow for the positive and precise adjustment to match the valve to your engine. This is achieved by using a unique single, conical, progressive rate spring that can allow for the retention of boost pressure over a wide adjustment range. This unique spring design also allows for unrestricted piston travel and flow volume regardless of the amount of pre-load adjustment added to the spring. Other manufacturers valves using cylindrical springs with adjustable pre-load often experience restricted piston travel and a reduction in flow volume. Please Note: This valve requires installing the opposite way to the original Bosch Valve. The side pipe is fitted into the Turbo Intake Hose and the base pipe connects to the hose that runs to the boost side of the turbo. We are dedicated to ensuring the highest possible quality service to our customers, always going above and beyond! See the tabs below for more information about us and our policies. We are a family run business started back in 2004 offering car customising and performance products from top brands such as Forge, K&N, Bailey, Wossner, Walbro, Gaz, The Loudest and many more. We also have products manufactured for ourselves and these are made to the highest standards. Over the past 9 years here at Motorbling we have also expanded our product range into standard replacement parts such as Brakes Pads from EBC and Wing Mirrors from Lucas, so we can now offer everything you need, from customising, to performance to standard replacement parts for MOT'S and general repairs. We offer fantastic service and discounted prices so why shop anywhere else. For most items, you have the right to return your goods within 30 days of receiving them. However, this right does not apply to items that have been altered upon request, have missing labels or show signs of being used. If you wish to return goods using this right, you need to inform us within 21 days of receiving the goods. You must take reasonable care of the goods and immediately return them at your own expense. Please ask for a "Proof of posting certificate" as we cannot be held responsible for goods that go missing whilst in transit. If you think weve sent you the wrong item or size, please double check the full description in the listing, including the UK size before requesting a return. 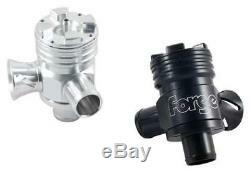 The item "AUDI S3 TT VW GOLF 1.8T Forge RECIRCULATION DUMP VALVE FMDVSPLTR" is in sale since Tuesday, July 19, 2011. This item is in the category "Vehicle Parts & Accessories\Car Tuning & Styling\Air Intake & Induction\Dump, Bypass & Blow-Off Valves".